I just spent the most delightful weekend at the Pikes Peak Writers Conference in Colorado Springs. If you’re into writing, and are on the fence about attending a writing conference, scale that puppy and go! I’ve been to several in the past few years, and I always walk away with my spirits bolstered and feeling more equipped to do my thang. At the PPWC, authors, editors and agents led workshops on a whole slurry of topics ranging from craft to marketing to the business of getting published. There was even a session on 18th century forensics for historical mystery writers. While the sessions were inspiring and left me wishing I had a larger brain to absorb it all, my favorite moments were interacting with other writers. A writer’s natural habitat often resembles some form of solitary confinement, so when you turn a bunch of them loose, it can get loud. It’s wonderful to be around others who understand how much joy chasing words around can be, and yet, how BLOODY FREAKING HARD it is to get those words published. Another thing I love about these conferences is the diversity. You meet the most interesting people. At my table one morning was a soldier who wrote a memoir on his experience in Afghanistan. Sitting next to him, a Viking impersonator who writes 6th century Scandinavian high fantasy. Despite thirty or forty years between them and wildly different manuscripts, they were yipping up a storm. Not about writing, surprisingly, but about how the Viking impersonator likes to drink Guinness from the horn on her Viking hat. But that’s another story. If you’re a writer in the Denver area, there are some great conferences coming up. Lighthouse Writer’s Workshop runs the STELLAR LitFest June 1 – 16. Rocky Mountain Fiction Writer’s Colorado Gold is September 7-9, and the Rocky Mountain chapter of the SCBWI runs their Letters and Lines conference Sept 22-23. So much I loved about this year’s Pikes Peak conference . . . the workshops, keynote speakers by industry giants such as Donald Maass, and most of all, meeting other writers. The worst part? Getting fleas. Technically, the fleas didn’t come from the conference. The hotel was very clean and shiny, as were the writers for the most part. The fleas came from the giraffes I fed. And I suppose they weren’t really fleas. But they were crawly little suckers and I’m sure I didn’t have them before the giraffes. My family trekked to Colorado Springs for the awards banquet, and the next day we visited the Cheyenne Mountain Zoo, where you can FEED GIRAFFES! It’s maybe one of the coolest things I’ve ever done. The giraffes are quite tame, and come right up to you with their long black tongues leading the way. With their bizarre combination of elegance, goofiness, and drag queen eyelashes, I’ve decided that along with llamas, I must have giraffes on my Pipe Dream Farm. I never fathomed I’d go to a writer’s conference and leave with giraffe spit on my hands, but there you have it. That’s why I love writing. You never know what’s going to happen next. Have you attended a writer’s conference before? What surprised you? This entry was posted in Uncategorized and tagged Lighthouse Writers Workshop, Pikes Peak Writers Conference, Society of Children's Book Writers and Illustrators by Beth Christopher. Bookmark the permalink. 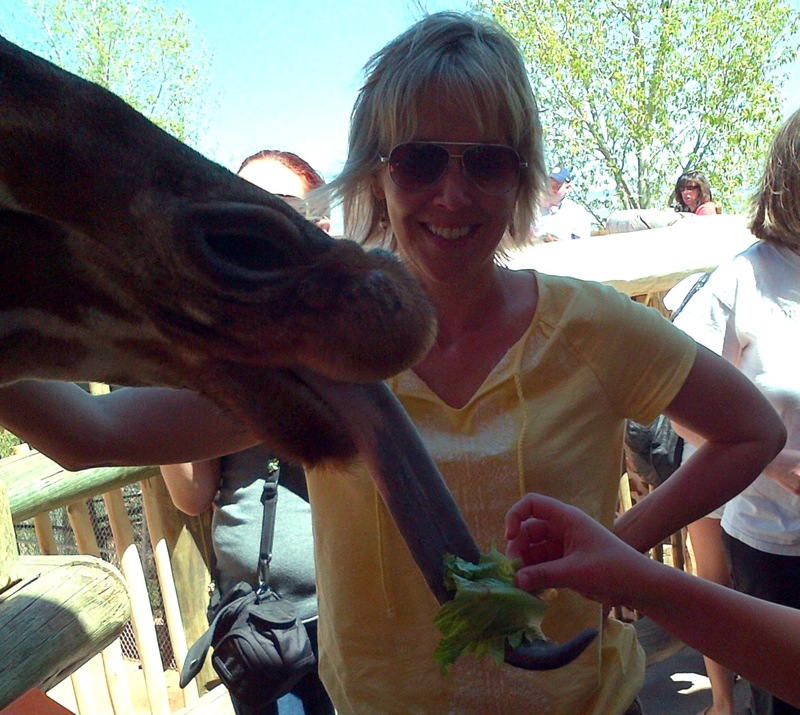 I haven’t attended a writer’s conference yet, but I HAVE fed the giraffes at the Cheyenne Mountain Zoo. No fleas that I know of though. Thanks for the conference info Beth…I’ll check it out!